All inclusive holidays are great for families, couples looking for pure indulgence, or those who are on a strict budget as you will always know exactly what you're spending. If you're looking for a completely hassle-free getaway, then choose a cheap all inclusive holiday and enjoy the convenience of having your meals, drinks, evening entertainment, and often water sports included. Unless you're planning on some additional excursions or a spot of souvenir shopping, then you don't need to worry about carrying cash around with you. 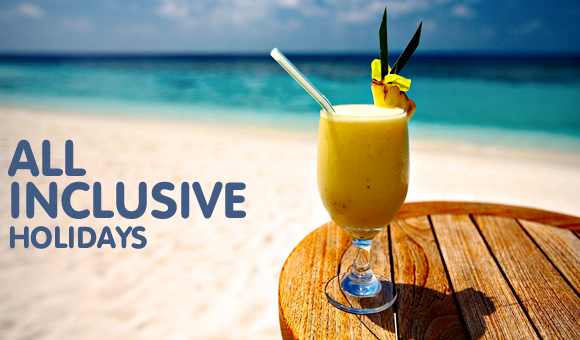 All-inclusive resorts get you so much more bang for your buck, because the one affordable price includes everything! You won't even need to carry your wallet, because everything is taken care of. Now that's relaxing - and don't you deserve it? Even the most avid do-it-yourselfer can have difficulty planning an entire vacation in a far off land. Our relationships with the highest quality hotels, vendors, tour guides and so forth helps us make your vacation as easy as contacting one of our professionals. We will quickly help you realize your travel dreams. · Top-notch service - some resorts include room service, beach butlers and more! Call us for an instant quote or for further information.